There are many causes of poor formation and misshaping of raspberry fruit, including bad weather, genetics or viruses. However, the most common cause is a lack of pollinators, such as domestic and wild bees, during the flowering period. 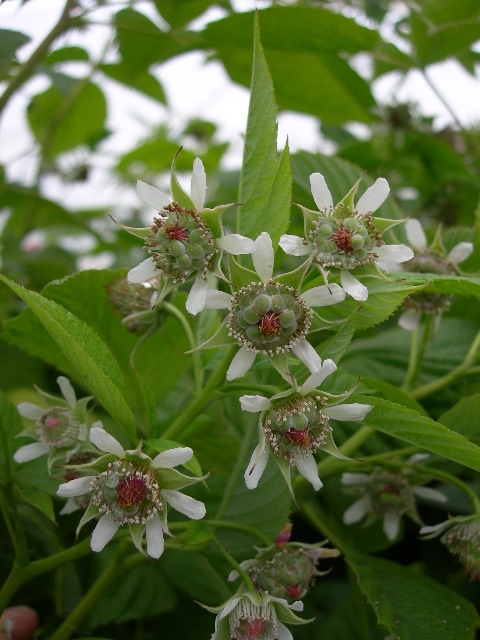 Although raspberry flowers are self pollinating, bee activity is still responsible for 90-95% of pollination. Generally, two strong hives are recommended per acre of raspberries. To understand how poor pollination can result in misshapen fruit, it is important to view the nature of the raspberry flower. The flower is composed of 100-125 pistils, to which the pollen must be transferred to create a mature seed and the druplet surrounding the seed. Around 75-85 druplets compose a raspberry fruit and each individual druplet has the same structure as a plum, cherry or peach. If each and every one of these druplets is not pollinated, the overall integrity of the fruit is compromised. This is because the immature druplet stays small, does not contribute to the structure and strength of the whole, and the resulting fruit is misshapen and crumbly (i.e. falls apart easily). 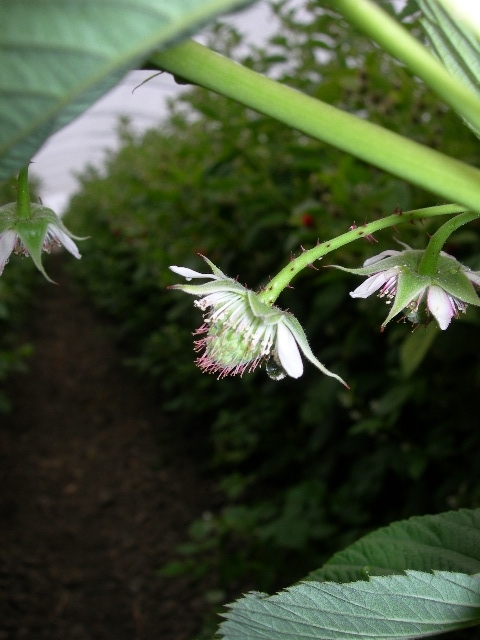 The pictures below demonstrate what improper pollination will look like in raspberry. In this case, many of the druplets at the tip of the fruit have not apparently been pollinated, and are staying immature and small. Beyond that, one can see clearly in the second picture that there is excess nectar accumulating on the flower, simply because it has not been collected by bees. Later, this nectar is certain to cause problems with sooty mold and other fungi, which flourish in this nutrient rich medium. 1. Hives must be strong. There should be many frames of brood in the spring and lots of bees in the boxes. Anything less will be an indication of a weak beehive. Flight activity should be heavy, and the raspberry field should be full of bees, not just a bee here or there. 2. Raspberry flowers are supposed to be quite attractive to honeybees. However, the possibility remains that they are being attracted to other flowers in the vicinity, either because they are more attractive, or because the raspberry crop is overwatered, meaning the nectar might be thin and not attractive. If a grower’s bees are not going to his or her field, they should be followed out to see where they are going. 3. Some pesticides, if not directly toxic to bees, may yet serve to repel them. Growers should take note of any changes in bee behavior or hive strength following pesticide application. I thank Dr. Eric Mussen from UC Davis for his valuable insight and contributions on this issue. Like the article, quite useful. We grow raspberries in modern plastic greenhouses in the South of Portugal. We have from time to time, especially with high temp. problems with pollination. Hello Göran, I am curious as to what you think the genesis of the pollination problem is then in a situation where high temperatures exist. Is it that bee activity is much reduced, or do you believe that the temperatures are inhibiting pollen survival and reception? Thanks for reading the blog - it's flattering to have an audience from around the world! we grow 2 cycles per year. start crop with long canes Okt/nov with harvest febr/may there after movdown and harvest again aug/sept. all grown in high plastic greenhouses / 5,5 to gutter / total height 8 m with good ventilation cenital and lateral. Climate screen / high diffusion used to regulate light, temp and Rh. Try to obtain 28ºC max (plant temp ) 600-700 mmol. Honey bee hives outside 6 hives per Ha plus bumble bee hives inside greenhouses. Problem is more in autumn crop. We have LOTS of flowers but it seems as they are not attractive enough as bees do not enter more than 10-15 m into greenhouse and low activity even on bumble bee hives. Temperature can reach 35ºC. But in the morning until 11.00 temperature very moderate and still low bee activity. Is the pollen, due to too many flowers of bad quality and not attractive enough or is timing of start using bees to late.? like to know your opinion. with our expansion of raspberry crop we most probably need to set up own apiculture. We need 800-900 hives of honey bees through our two season flowering. In-between the honeybees still have to get enough nectar to survive. Do You have experience and suggestion of vegetation, that can be used for this purpose.?. No, Göran, I don't know offhand what sort of vegetation one could suggest for off season nectar gathering, but I think I can find out. Give me a bit and I'll get back to you. thanks for prompt answer. I will dig into the material from my side, but so far very little new news. The tough period is probably autumn period as when we get into short days. I will need to feed about 1000 hives. In ref. to your last blog. very good ! Göran, thank you for your interest in this vinegar fly work. The presentation as a matter of fact is a very good one, and I am sorry you won't be able to see it. I will forward you the presentation on the email - let me know if you questions about it. Bumblebees do a great job on pollination, but unfortunately the use of hives of them in California is restricted since these are seen as invasive. I do not agree with the second picture and the associated explanation "in the second picture that there is excess nectar accumulating on the flower, simply because it has not been collected by bees". The picture shows an immature raspberry which, by the looks of it, has been properly pollinated. I doubt a bee will still be visiting this particular fruit, as it is no longer a flower (perhaps to check it out, but it will not stay as long as it would on a flower in an earlier stage). In my experience, the nectar that is being excreted is in fact the result of too high root pressure, resulting in excess guttation. This can be caused by a sudden increase in humidity whilst the plant is still fully evapo-transpiring. Or, of greater concern, it can be caused by irrigating with a solution of too low EC (in case you are growing on substrate). This increases the osmotic pressure in the plant, if too high, it will result in some of this water (along with nectar) to be excreted from the flowers. Once you have drops of nectar forming on your flowers or fruit, it is too late. No bee will be able to "clean" your flowers for you. You will have issues with sooty mold come harvest-time. Johan, thanks for your insightful comment, and it sounds like you are pretty familiar with this, so I am flattered by your attention! Thinking back to this situation, the number of bees on this ranch (farmed in soil) was really low, so I was left with the impression that bees were not collecting nectar at all, allowing it to build up over time. I didn't think either that a swarm of bees could come in and clean it out. As you say, it was too late. Also, the fruit on this farm were not properly pollinating (picture one; hence the call by the grower for some advice). Only the top two rows of druplets were pollinating, very likely because the plant was able to self pollinate those, the others being dependent on bee activity didn't take.